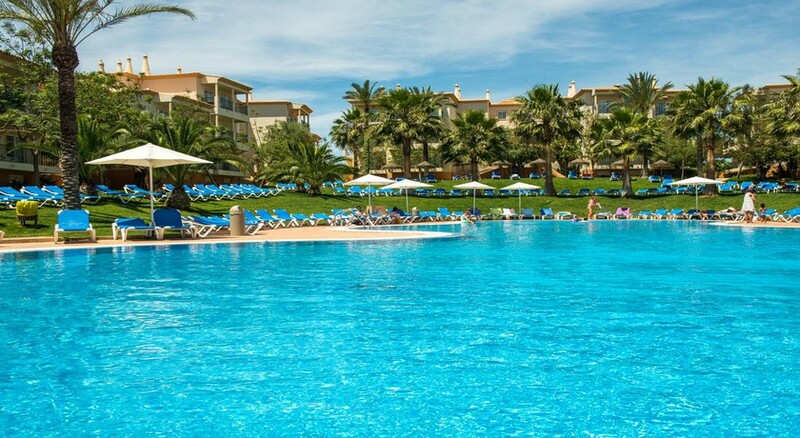 Clube Humbria is a 4-star resort providing ideal accommodation facilities for families in Albufeira, Algarve. The resort is situated in a lovely traditional fishing village of Olhos de Agua surrounded by verdant gardens. The apartments are well furnished topped with traditional terracotta roofs and set among the beautiful well-maintained gardens. They overlook the gardens and the swimming pools. The golden sandy beach is near to the hotel where different water sports can be enjoyed. The Albufeira town is only a 15-minute walk from the hotel. There are a range of leisure and entertainment options at Clube Humbria for all ages of travellers. These include video games room, kids' club, multi-purpose court, massage service, daily entertainment shows and outdoor swimming pools for adults and children. Clube Humbria is situated near the Albufeira at about 3 miles. The beach of Olhos de Agua is at a distance of 850 metres. The Albufeira town is also near at about 8 km from the resort. Within 60 metres, various shops, bars and restaurants are available. 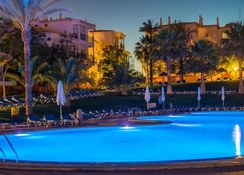 The resort can be reached in 60 minutes from the Faro Airport by coach. The famous Golf Courses of Pine Cliffs and Balaia are only 2 km from the resort. The resort has about 193 rooms situated within the 9 apartment buildings. Each building has 3 floors with 8 lifts. The well-furnished cream washed apartments are surrounded by lovely gardens. Rooms are spacious and airy with neutral walls and tiled floors. All rooms have air-conditioning, double beds and fully equipped kitchenettes for preparing light meals. Bathrooms have shower and WC and all other bathroom amenities. The lounges have 2 extra beds. There are balconies with pool and garden view, which are available upon request. The buffet restaurant of the resort offers a wide variety of Mediterranean and International dishes. It serves breakfast in buffet style with fruits, cakes and eggs. At lunch and dinner, guests can choose from a variety of meat, fish and vegetarian dishes. The Humbria buffet restaurant offers live cooking at breakfast and dinner and themed dinner’s occasionally. Bar Melody is the best place for having drinks after dinner. Guests can enjoy cocktails while watching an evening entertainment program. The grill restaurant serves light lunch and snacks, which is also included in the all-inclusive package. 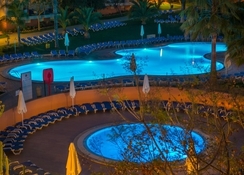 The club Humbria has a large free-form pool in the centre of the resort. The pool is framed by sunbeds and drinks and snacks are offered here by the pool bar. Kids can enjoy in their separate pool. Sun terrace and loungers are available for relaxing in the sun. There is a pedal court, football court, table tennis, air-hockey and volleyball for sports lovers and a kid’s club for entertaining the little ones. A gaming room provides entertaining arcade games and the outdoor playground, giving the best opportunity for spending leisure time. Bikes are available for hiring. Aerobics and Aqua aerobics classes are available all day. The entertainment team creates a full fun and entertaining environment by showing comedy acts, singing shows, and many other activities. A mini disco is present for children to have fun. Stayed here in June 2017 for my sons 1st birthday along with my 3 year old son, husband and mum. This hotel is ideal for families; large, comfortable apartments surrounding 2 great pools, one large pool and a separate children’s pool. The water slides make a nice break from sitting round the pool. The all inclusive has a wide range of foods, you could eat large cooked meals at every sitting or easily make a refreshing salad. Ice cream and alcoholic and non alcoholic drinks available all day. The staff are friendly and made an extra special effort for the 1st birthday celebrations. We had a perfect relaxing trip away, Hotel was perfect for our needs.